I will forewarn you…if you can't handle words like….vomit…diarrhea…you may want to stop reading now! 🙂 This post may get a little graphic! I wonder how long your rope is….you know the rope…the one that you suddenly get to the end of…and the insanity starts in? 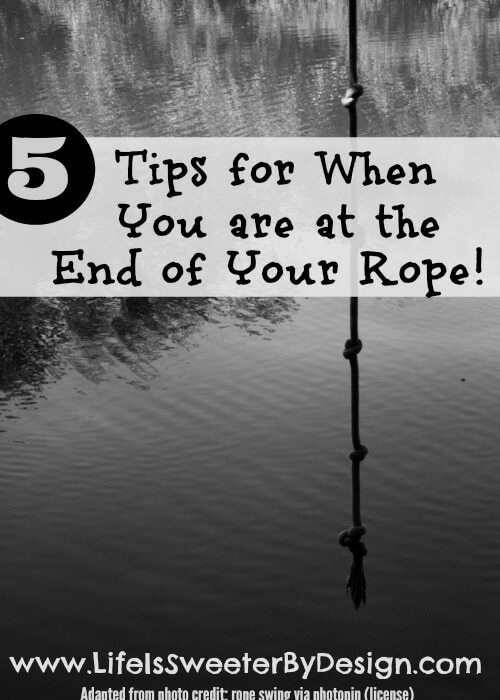 I reached the end of my rope recently….more than once! Praise God, He lengthens the rope in emergencies! I will tell you what pushes me to the end of my rope the quickest…ILLNESS. Those crazy, vicious little viruses that just jump from one child to the next….and won't let go!! Before I go any further I will make a little confession….I can lean to the dramatic side when things go wonky. Yes, I was involved in theater for a year in college…so I guess that could be part of it. I can be a little dramatic….but that is just me! Let me just give you a little history of my ROPE…back when I had a full rope. Things were clicking along pretty well at our house. I got off work on a Thursday afternoon and had that “feeling”…you know the one…you can tell you are getting sick. I could feel the head cold coming on. My head felt funny, my neck was sore…subtle signs…but I am old enough to recognize them. I hate head colds…I feel horrible during the cold and they seem to last forever! I pushed through…by Saturday I was in the midst of blowing my nose every few minutes and whining about how horrible I felt! (if only I knew the fun that was to come…) Later in the day on Saturday I started having some tummy troubles…in real terms…diarrhea and upset stomach! It wasn't severe…just occasional…for the rest of the weekend. I just felt lousy. Monday afternoon came and I was feeling a lot better and went to pick up my kids from school. My 8-year-old comes walking out looking like death warmed over…she gets in the vehicle and says that she has been having diarrhea all day…oh goody. 🙂 I take her home and get her settled in…only to turn around and see my 2-year-old vomit all over the kitchen floor…. Now…I only work 3 days per week…as a school nurse. I had to miss that entire week of work…the 8 year old felt better after one day and went back to school. The little one vomited and ran a fever for 2 days and then started in with diarrhea for several more days…adding back in some more vomit…you catch my drift. I have 4 kids…this isn't my first rodeo with intestinal issues…plus I am a SCHOOL NURSE….I have seen it all. Long story short…..I made it to work ONE DAY in 2 weeks….things came to a head when I was sitting on the toilet one morning after having had emergency diarrhea most of the night. I had my head in my hands…my husband comes to the doorway and I let him know that I was sure I would be dead by noon. (yes…I told you I was a little dramatic) He assured me from a distance that I would survive this! I did eventually make it back to work and truly do thank God that I have a kind and understanding Principal. It had been a while since I had had a month where I was so…so…so at the end of my rope. I was thinking back on this horrible month….and realized these were some things that kept me from falling off the end of my rope into that abyss of self-pity and depression! Even if you are a single parent or in a lonely marriage with a partner that isn't much help…you aren't alone! God is there and loves you and cares about your situation. It is hard for me to comprehend that God cares about little things like my stomach bug…but He does! If I will take the time to pray about my issue, He will hear my prayer! It is hard to humble yourself and ask for help. In my circumstance last month I really couldn't ask anyone to come over and help me. I didn't want to expose anyone to the horrible virus that we had. My mom felt horrible that she couldn't give me a break and keep my sick children for a little while…but instead she made us dinner a couple of times and that helped me a LOT! You may need to call and ask someone for help when your rope has run out! Most people would be happy to lend a hand or provide a meal! Just like I talked about in my post, It's Only a Phase Mom…it is doubtful that your current situation will last forever. (Please note this article is not addressing chronic or terminal illnesses) You are going through a valley in parenting or just in life…for those of you that do not have children. Sometimes life is just hard…it seems like it can be one thing after the next…but usually things will eventually turn around. Stay positive and remind yourself this is temporary! I use the term cursed here very loosely!! 🙂 I have thought before that I must have really ticked someone off to be getting blasted with one thing after another. I have to stop and remember that even though my current situation stinks…overall I am very blessed. I heard a sermon recently that gave statistics about how rich even the poorest American is compared with most people around the world. I am trying to remember those things when I am feeling really sorry for myself! I had to remind myself that I was fortunate that I could stay home with my kids when they are sick. I was fortunate to have a job that provided me with sick leave. I was so glad to be able to have an actual TOILET when having diarrhea every 30 minutes!! See…there is always something to be thankful for!! I am sure that many of you can relate to my month. I know that I talk to a lot of women who are at the end of their rope for various reasons! It happens….it is hard…but it isn't forever! How long is your rope? What puts you to the end of your rope the quickest?? I would love to hear from you! We all have been there haven’t we? I am nurse also, and have three kids, I have saw some seriously unpleasant things. When my boys were all little my middle one had the flu. He wouldn’t let me sit him down for 3 days! Not to even change his diaper! I had to change his diaper on my lap. Eat with him on my lap. I didn’t get to bath. My husband and sister tried to help but he was so feverish and sick and he would cry and I would just hold him. At the end of that week I felt like it was just me and him on a deserted island. Alone, stinky, and hungry.Now he is 17 and barely grunts at me occassionaly. Oh, the joys of motherhood. Good blog. I enjoyed. Isn’t it nice to be able to share with someone who really gets it! 🙂 That is so funny, my son is also 17 and when he was about 9 months old, I am sure he had rotovirus. He was SO sick and we sat in the recliner for almost a week. Now he is also grunting at me if I am lucky! 🙂 Thanks for sharing!! Oh man, that sounds like the worst case of illnesses ever! I have a tendency to just want to do things on my own, even when I’m sick, and that never ends well. I was cleaning within 48 hours after my gallbladder surgery… talk about a bad idea! Well bless your heart. When it rains it pours, uh? Hopefully your next month will shine like your picture!! So true! I also struggle when I’m indoors all day, and I find I can easily convince myself to sit in front of my computer all day. Thank goodness winter is over (hopefully) — it was getting rough. I am so glad for the warmer weather too! You are so right! I prefer to be at home unless it’s due to weather or sickness. It’s so confining. My favorite tip was the need for sunshine. It helps any mood I find myself in! Nice reminders. We often forget the obvious advice, especially when we are at the end of our rope. Love the one about getting sunshine. I have never had a window in my office at work until this week. Looking forward to the difference sunshine will make. That is great! I have had an office with a window the past 2 years and LOVE it so much more than my last one that was interior with no windows! Enjoy!